is one of the Great Feasts of the Orthodox Church , celebrated fifty days after Pascha . For the feast of Pentecost the icon of the Holy Trinity, the three angelic figures who appeared to Abraham, is placed in the center of the church for veneration. This icon is used with the traditional Pentecost icon. The church building is decorated with flowers and the green leaves of the summer to show that God's divine breath comes to renew all creation. Green vestments and coverings are also used. In many parishes the feast is celebrated starting the evening before with Great Vespers . Some parishes also serve Matins on the morning of the feast before the Divine Liturgy. The Liturgy of Saint John Chrysostom with special hymns replacing the standard Antiphons . The hymns O Heavenly King and We have seen the True Light are sung for the first time since Easter, calling the Holy Spirit to "come and abide in us," and proclaiming that "we have received the heavenly Spirit." An extraordinary service called the Kneeling Vespers, is observed on the evening of Pentecost. This is a Vespers service to which are added three sets of long poetical prayers, the composition of Saint Basil the Great, during which everyone makes a full prostration, touching their foreheads to the floor (prostrations in church having been forbidden from the day of Pascha (Easter) up to this point). In many parishes, this service is done immediately after the Liturgy. 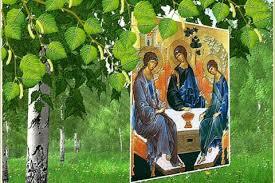 Trinity Sunday is one of the most beloved and bright holidays of Russian people. Trinity Sunday , Pentecost, Day of the Descent of the Holy Spirit is one of the Twelve Great Feasts of the Orthodox calendars, celebrated 50 days after Easter, on the 10th day of the Ascension Day. Celebration in honor of the Holy Trinity was legalized by the Church in the IV century. 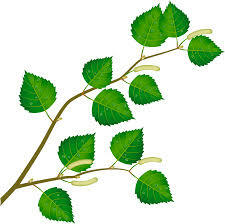 For Russians Pentecost is associated with birch, which has become a symbol of Russian nature. On Trinity Sunday Orthodox churches were decorated with fresh greens, worshipers were holding birch twigs and flowers during the service. On growing birches people usually curled branches, twisting them with each other or with flowers, grass, ribbons. Each farmhouse was decorated with a young birch tree and in homes twigs were put by the icon, or put on the shrine. After the holiday, dried twigs served as a protective for all ills . Therefore Trinity Sunday was considered women’s feast, or rather girlish. On this day the girls wore to church and festivals their best outfits. Traditional girl's decoration on Trinity Sunday was a wreath of flowers and birch twigs, and in the northern regions - hats, embroidered with gold thread and metal plates. 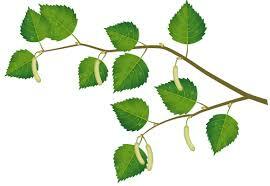 There were also special maiden rites, like weaving of wreaths, birch decoration. Holiday always included a meal for the girls, which was arranged jointly, and the main dish was fried eggs. Saturday before Trinity Day is the day of commemoration of the dead. People used to go to the graves of their relatives and swept them with small brooms made of green birch twigs, sanctified in the church. Souls were also commemorated with painted in green eggs. On the graves people left birch twigs, flowers, crumbled eggs, cakes and grain. An important part of the holiday festivities were open air celebrations and fairs. After the church service, young people went to the streets, sang, danced and met each other. also known as Butter Week, or Cheesefare Week) is an folk holiday, celebrated during the last week before Great Lent, that is, the eighth week before Pascha(Easter). During the week of Maslenitsa, meat is already forbidden and it is the last week during which eggs, milk, cheese and other dairy products are permitted, leading to its name of "Cheese-fare week" or "Crepe week". The most characteristic food of Maslenitsa is pancakes made from the rich foods still allowed by the Orthodox tradition that week: butter, eggs and milk. Since Lent excludes party,secular music, dancing and other distractions from spiritual life, Maslenitsa represents the last chance to take part in social activities that are not appropriate during the more prayerful, sober and introspective Lenten season. The last day of Cheesefare Week is called "Forgiveness Sunday" (Прощёное Воскресенье). Relatives and friends ask each other for forgiveness . At Vespers on Sunday evening, people may make a poklon (bow) before one another and ask forgiveness. Another name for Forgiveness Sunday is "Cheesefare Sunday", because for devout Orthodox Christians it is the last day on which dairy products may be consumed until Easter. Fish, wine and olive oil will also be forbidden on most days of Great Lent. The day following Cheesefare Sunday is called Clean Monday, because people have confessed their sins, asked forgiveness, and begun Great Lent with a clean slate. 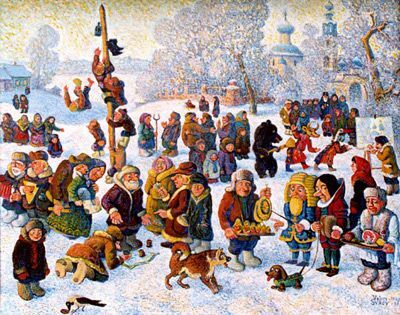 Christmas in Russia is normally celebrated on January 7th. The date is different because the Russian Orthodox Church uses the old 'Julian' calendar for religious celebration days. 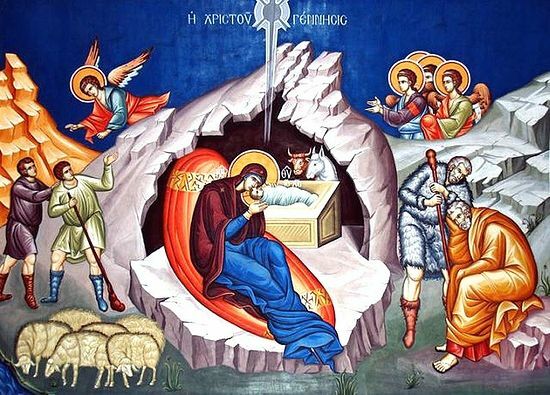 The Orthodox Church also celebrates Advent . But it has fixed dates, starting on 28th November and going to the 6th January, so it's 40 days long. 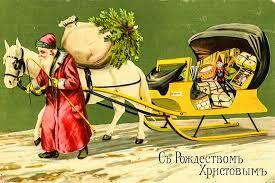 In Russian Happy/Merry Christmas is 's rah-zh-dee-st-VOHM' (C рождеством!) 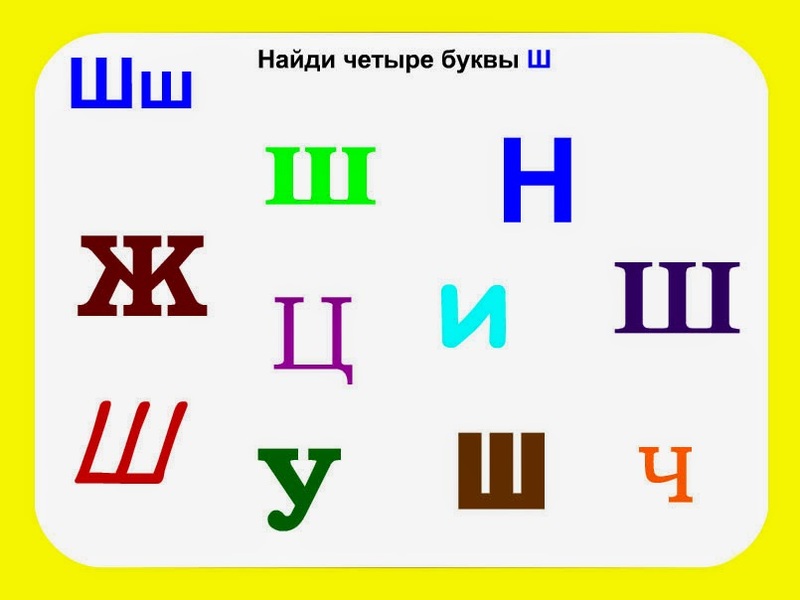 or 's-schah-st-lee-vah-vah rah-zh dee-st-vah' (Счастливого рождества!). On Christmas Eve, a Holy Supper is given, It consists of 12 traditional dishes, all of them meatless it is still Advent, in honor of the Twelve Apostles. The Russian word for Christmas Eve 'sochelnik', comes from the word 'sochivo'. Other popular Christmas Eve foods include, beetroot soup (borsch) or vegan potluck (solyanka) served with individual vegetable pies (often made with cabbage, potato, or mushroom); sauerkraut, porridge dishes such as buckwheat with fried onions and fried mushrooms, salads often made from vegetables like gherkins, mushrooms or tomatoes, and also potato or other root vegetable salads. The meal often consists of 12 dishes, representing the 12 disciples of Jesus. Following the meal, prayers might be said and people then go to the midnight Church services. Throughout the service, the faithful sing ”God is with us…In the morning the Divine Liturgy is celebrated. Children get presents on Christmas when 'Grandfather Frost' (known in Russian as 'Ded Moroz' or Дед Мороз) brings presents to children. He is always accompanied by his Grandaughter (Snegurochka). On Christmas children hold hands, make a circle around the Christmas tree and call for Snegurochka or Ded Moroz. When they appear the star and other lights on the Christmas tree light up! Ded Moroz carries a big bag of presents . In some areas, children will go carol singing Koladki round the homes of friends and family and to wish people a Merry Christmas. They are normally rewarded with cookies, sweets and money. There are many feasts, which Russians like to celebrate. The main is the spring feast Easter. It is a light and kind feast brings belief, hope and love. Approximately 5 thousand years back Judaic tribes celebrated this spring day as a feast of calving of cattle, and then Easter was connected with beginning of harvest, later - with leaving of Jews from Egypt. Christians have enclosed other sense of this day and celebrate it in connection with resurrection of Christ. The First Ecumenical council established day of commemorating of Easter in 325 year: the first Sunday after the first spring full moon. Then it was decided to transfer an orthodox feast for one week after Jewish. The event of resurrection of Christ has taken place in the third day after death of Jesus, not earlier than the first hours after sabbatical day. Prophets and Jesus predicted it. This day there was a great earthquake; angel came down from heavens, threw away the stone from a door of a coffin and sat on it. When devout women among whom there was also Maria Magdalena came to pray at a coffin, the angel has announced about Resurrection of Lord. When Jesus has appeared he was accepted as a gardener and when the Magdalene has recognized him, He ordered to go to apostles and to inform them that have come to pass both the death and Resurrection of Christ. Maria obeyed and has gone, and on road told to everyone about large joy of Resurrection of Christ. The Resurrection of the God's Son defeated death of flesh and opened the way for spiritual life. Easter for Christians is transition from death to eternally blessed life. Word Pasqua is Jewish one, it means passing with the Christ to other life, deliverance from death. In ordinary meaning, Easter is meant as sacred week of Resurrection of Christ during which, the Holy gates in churches remain open meaning that now Resurrection of Christ opened heaven for all. The Quadragesima previous to Easter abruptly changes mode of life of religious Russians. In old times within first week of Fast any entertainments, theatrical representations and music were forbidden. Only public bathing houses operated. Nowadays only deeply believers follow these strict rules. They say that Christ and apostles during forty days wander on earth in beggarly vestment. They test human mercy, award kind and punish greedy and malicious. Last week of the Fast is called Holy Week. Eve of Hoy Week is called Palm Sunday, a holiday of Entrance of Lord to Jerusalem. In Orthodox temples during a liturgy consecration of twigs of willow take place - this is to remind about palm twigs with which the way of Savior to capital of Judea was covered. Everyone try to get some twigs to put them by icons till next "Willow Sunday". On eve of Easter people cook special dishes, they bake rich Easter cakes, make Easter cottage cheese cakes and paint eggs. Usually eggs are painted on Saturday, and then on Saturday are brought to the church to consecrate. There are a lot of different Easter cakes. All paschal week people feast with rich meal with meat, eggs and other meal that were not allowed during 40 days Fast. Celebratory tables burst with many different dishes. Egg is the main paschal symbol of resurrection as and egg brings new essence. There is an old Russian Easter tradition - in this day people greet each other with three times kisses and with words "Christ arise!" At paschal greeting and salutation believers give each other red eggs. This custom comes from old times. When Maria Magdalene came to emperor Tiberius, she brought him as a gift a red egg with salutation "Christ has arisen!" Red color " is color of blood on the cross that Christ shed for atonement sins of the world. In order to dye eggs it is possible to use fuchsine, onions peel, and bright scraps of silk. In different regions Paschal eggs has own ornament and manner of drawing. For coloring eggs it is the best to use onion peel, which is gathered in advance. Depending on color of peel coloring of eggs vary from bright red to dark brown. If you want color to be more saturated take more peel and boil it about 30 minutes. To protect eggs from cracking during boiling add into water some salt. Do not place cold egg (from a fridge) into boiling water; let them to warm during half of hour. There is way of painting eggs " in a speck ". For this purpose wet eggs are crumbled in dry rice, then are wrapped in gauze (the ends of a gauze densely should be fastened by a thread in order rice stuck to the egg). Then eggs are boiled in a dying solution in usual way. In order painted eggs shone, they should be wiped dry and grease with sunflower oil.